I’m not sure I’d do very well after an apocalypse. I can’t whittle spoons like Bear Grylls, I can’t mine and wouldn’t know the first thing about where to start looking for ore and I’m not exactly a Bronzed Adonis hunter-gatherer type. I’m just an average sized chap with a plethora of Physics degrees and a penchant for board games. The former seem to have proven about as useful to me as a one legged man in an arse-kicking contest, but the latter certainly did put me in good stead for what I’m doing right now: babbling unwaveringly at a curious reader who came here to learn about a recent board game and is instead being told a series of useless facts about the author. I found New Earth on a fairly imposing stand at the recent UK Games Expo under the overhead banner from Ergo Sum Games. Piles of boxes surrounded a hefty demo area as New Earth had been recently released following its successful Kickstarter and was being shown off in some style by the games designer, Nick and his team of minions. 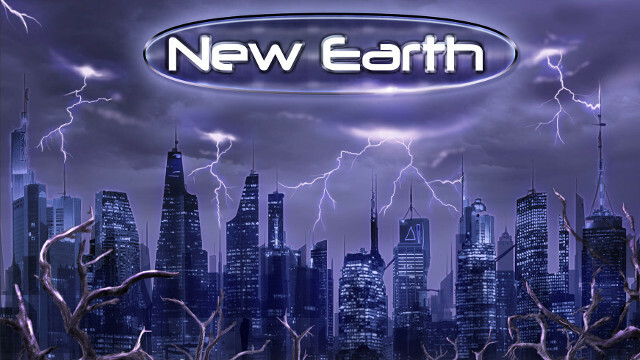 If it wasn’t already obvious, New Earth is set in a post-apocalyptic vision of Earth where human survivors inhabit the only remaining continent on the planet. It’s up to these people to attempt to rebuild society on a planet as stable as a skateboard in a canoe whilst competing with other player factions trying to do the same thing. New Earth requires resource gathering and management, political influence and some good old fashioned ousting to make sure you win. The ultimate goal is to amass VPs through city development – build bigger cities and you’ll do well. 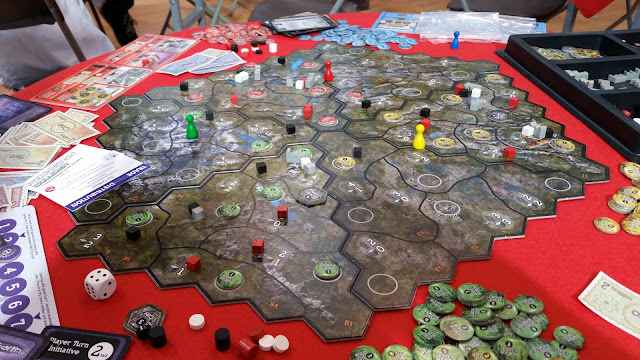 The layout of the game is quite interesting – each player has a hexagonal-edged section of the game map, each of which then interlocks to form the board. Each section has 6 areas within them, each containing a certain amount of resource or population. Each board is different so there’s plenty of variation – Nick mentioned that he’s calculated over 8,000 iterations of the game, so unless you’re imprisoned in the Bastille, it’ll be hard to have the same game twice. To further your cause, you must mine resources, build production units and expand your borders. Your faction will need to support itself so don’t forget to create or buy the right resources to do that. Different combinations of resources will permit different items that can be bought – upgrades, food etc. If you don’t support your cause, it will lose areas of the map and you’ll struggle to catch up. The one thing that really stood out in New Earth was the way in which territory is captured. It’s not a wargame, there’s no fighting. Instead, the novel mechanic is the notion of elections when you move to acquire more territory. Move into the area and there’s a background election which you can choose to influence by paying money. More money means more influence so you can be more certain of the result. The twist is that anyone can do this to anyone else – the beauty of this is that you can just instigate an election to cost your opponent, then not bother further, just to ruin their day. A tactic I found rather entertaining. However, don’t get too smug. The other main mechanic is the cards in the game that assist your cause, but they also contain a hefty number of disasters. Whilst very entertaining to see a flood wash away all your opponents materials, the tables can quickly turn on you as a card may not go your way. Nick was very keen on the word “schadenfreude” and he’s bang on the money. It certainly provides the opportunity for a few sadistic giggles while your opponent grumbles after losing a pile of stuff. Despite my play through being a shortened demo, I saw enough of New Earth to know that it’s definitely my kind of game. Resource Management, territory control and a good dose of self-interest all mix together to provide a very entertaining game. Another one on my ever-increasing “Games to buy”.